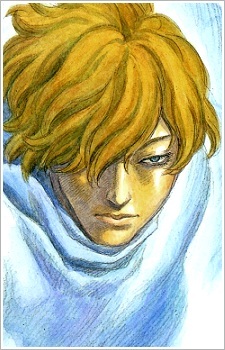 Serpico is Farnese's companion and unbeknownst to her, her paternal half-brother. During his time with the Holy See, Serpico was Herald for the Holy Iron Chain Knights. When aggressive, Serpico belies his meek appearance and is comparable to a fox due to his shrewd observation and speed with a rapier. Despite Farnese's childhood abuse and her forcing him to burn his own mother at the stake, he cares deeply for his half-sister. Serpico was her servant since she found him beaten on a snowy street over a decade ago. Serpico's relationship with Guts has forever been plagued with animosity, due in large part to the dangers that inevitably surround Guts and anyone he takes into his Band. After a duel with Guts in the underground pillars of Vritannis, Guts spared his life. Their bond rekindled, and Serpico has since learned to trust Guts to protect Farnese when he can not. Serpico uses two items blessed by the wind spirit Sylph in order to battle with tolerance alongside Guts: a rapier that can generate razor sharp gusts of wind; and a cloak that constantly generates a swirling vortex around its wearer which can deflect projectiles, assist in jumping, and slow falls from great heights.